CS Ed Week is an international effort to lift up the importance of CS in schools around the world. Schools mark the occasion with hackathons, guest speakers, or an Hour of Code. 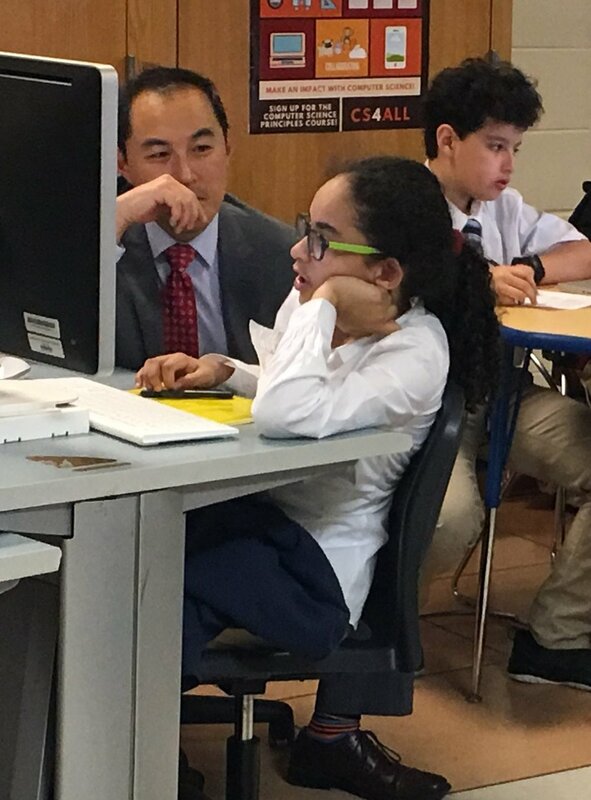 The NYC Department of Education kicked off their celebration at IN-Tech, a comprehensive secondary school serving a 6th – 12th grade population from within Community School District 10 under Superintendent Maribel Hulla. Ms. Colavito is Beth Colavito, who teaches 6th grade computer science honors. We had a chance to visit her classroom, where students were using a randomizer to determine how many of each color M&M candy would be in each bag. The funders, educators, and staff members in attendance talked to the students about their experiences in learning Scratch and creating the candy software. After leaving Ms. Colavito’s classroom, the group traveled to the library to engage with students participating in the new CS4All Hack League. Through hackathons, students are encouraged to apply CS concepts and practices they’ve learned in the classroom to solve real world challenges by creating digital games and apps to tackle themes including news literacy, wildlife conservation, kindness and empathy, and connected cities. In the first-ever CS4All Hack League, winning teams from 75 high schools and middle schools across NYC will compete in borough-level brackets and then advance to a citywide final competition. The students excitedly spoke with the group about their CS Hack League exploits. CS Ed Week is celebrated as part of Computer Science for All, a public-private partnership with New York City supported by a range of foundations, corporations, nonprofits, families, and individuals. Major partners include CSNYC; Robin Hood; Math for America (M f A); Robin Hood Learning and Technology Fund; Oath Foundation; Alexandria Real Estate Equities, Inc. and the Paulson Family Foundation. They are joined by additional partners such as Wachtell, Lipton, Rosen, & Katz; Hearst Foundations; the Ron Conway Family; The Rudin Foundation and the May and Samuel Rudin Family Foundation; Accenture; and Arconic Foundation. The Fund for Public Schools, CSNYC, and the Office of Strategic Partnerships at City Hall work together to develop and manage these partnerships. If you think you or your organization might be able to help make CS4All a reality, join our donors and supporters today.